Hugo Grotius, also known as Hugo de Groot, was born on the 10th of April 1583 in the city of Delft. He studied at the University of Leyden (Leiden) and became a lawyer when he was 15 years old. In his life Grotius was a philosopher and poet, but became famous for the foundations he laid for international law. One of his famous works is "De jure belli ac pacis" (On the Law of War and Peace) dating 1625. This work is usually considered the first definitive text on international law. In his work he contended that natural law prescribes rules of conduct for nations as well as for individuals. He derived much of the specific content of international law from the Bible and from classical history. Another famous work is "Mare Liberum" (Free Seas) dating 1604. In this book he formulated the new principle that the sea was an international territory and that all nations were free to use it for seafaring trade. 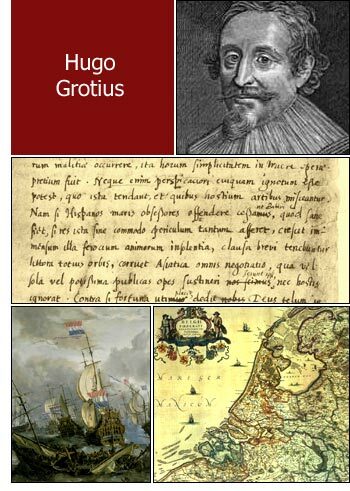 Grotius stated that no country could monopolize control over the oceans and seas. In Dutch political affairs Grotius supported Johan van Oldenbarnevelt, lawyer & Prime Minister of the United Netherlands, against Prince Maurice of Nassau. After Maurice of Nassau gained power he had Grotius condemned to prison for life, but Grotius made an escape, hidden in a bookcase, from his prison at Castle Loevestein in 1621 and fled to Paris.